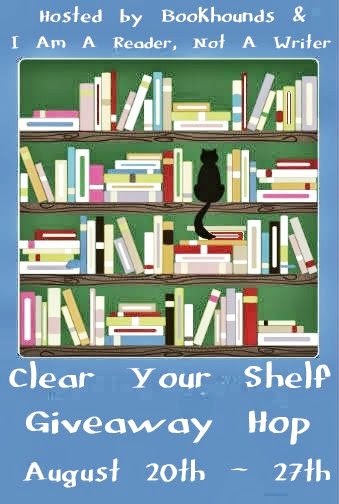 Jessabella Reads: Clear Your Shelf Giveaway Hop: Enter to win a huge box of 12 young adult titles! Clear Your Shelf Giveaway Hop: Enter to win a huge box of 12 young adult titles! Thanks for stopping by my Clear Your Shelf Giveaway! This hop is hosted by BookHounds & I Am A Reader, Not A Writer. Since I need to clear some space on my shelves for the new review copies I have been receiving, I decided to give away a big box of books to one lucky reader. Pictured above are the 12 books that the winner will receive. There is a mix of ARCs and finished copies. One winner will receive all of the books pictured above. Wow! You really did some shelf cleaning. Thanks for the giveaway opportunity. OMG!! These all are books I am DYING to read!! Awesome picks! Thank you so much for being a part of this fun and awesome blog hop! !